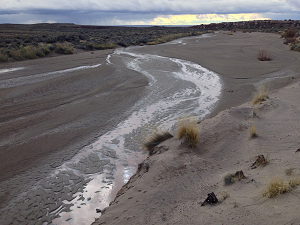 Designated as a stream by the U.S. geological survey, this wash is a tributary of the larger Polacca Wash. It is located near First Mesa on the Hopi Reservation within Navajo County, Arizona. "Jim Camp Wash, January 11, 2015" by Akos Kokai is licensed under CC BY. and Jim Chee Mysteries. Salt Lake City: University of Utah Press.